If there is any swelling immediately after the procedure, an ice pack should be applied for no more than 15 minutes at a time. You may experience the following for several days after the procedure. 1 Eyelashes or eyebrows sticking together in the morning. Rinse eyes with eye wash daily for 5 days. If eyes continue to stick together inform us ASAP so we can get drops for your eyes. 3 Gently apply aquaphore. Do not USE in eye area. Use artificial tears only on eyeliner. 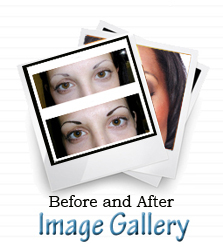 If tattoo becomes oozy, discontinue aquaphore and call your permanent makeup technician. 5 Do not pick or scratch tattooed area. 6 For after care on hair simulation procedures, do not wash the area, scrub, pick, or get any chemicals on the area until it is healed. 9 Use sun screen and avoid harsh chemicals or Retin A, this may colour to fade or discolor. 10 Do not put anything at all on tattooed area except aquaphore or emu oil. That includes lotions, tanning creams, makeup, antibiotic ointment, Retin A, water, or terri cloth towels. DO NOT USE ON EYELINER-USE ARTIFICIAL TEARS. 11 The tattooed area will be dark for the first several days and will fade. Lips will fade about 50% after the first three days into a natural shade. While healing, the tattoo will look spotty. 12 Stay out of chlorinated pools, sun beds for at least 1 week. 14 If cold sores are seen on the lip area, call your doctor for a Valtrex prescription ASAP. Put nothing else on the lip area! You may use emu oil on cold sores but ask your technician. 15 If your eyes are red from the eyeliner procedure you can use emergency eyewash that can be purchased at any drug store. Eyewash that contains boric acid works well. 16 You should apply aquaphore on your lips every hour for the first three weeks. This will prevent dryness. 17 If you experience an allergic reaction contact your doctor ASAP, and contact Cheryl Rosenblum (404) 229-7372. Please sleep upright for the first night. 18 No smoking immediately following the lip procedure. If smoking can be avoided, apply a heavy coating of aquaphore and cover your lips with your hand while smoking. · Shower with your back to the water to avoid water, shampoo and conditioner from getting into the pigmented areas. Have a sufficient amount of Shea Butter or Shea Oil on the pigmented area during showers. Do not be alarmed by fading after the first application. The final color cannot be judged until at least 3 weeks after the touchup applications are completed. This is the reason follow-ups are required. NOTE: Inform your doctor if you plan on having laser so that he can cover the tattooed area. Also collagen and permanent makeup do not mix! If you want collagen, get collagen first and permanent makeup after. You may have to get more touchups with collagen because of the lip distortion after collagen. *****alert**** Exact colour cannot be determined and may need to be adjusted. All skin is different and more touchups may be needed. Colour needs to be checked every year. No refunds on permanent makeup. Please do not get this done if you are not able to get required touchups. Micro Pigment Implantation, otherwise known as Permanent Cosmetics is a two or more step process. The results cannot be determined until after the touch up applications. We perform this service to the best of our ability, and to achieve the desired results, your cooperation is required in the following instructions. Swelling: Very slight. A little redness in the immediate area. Moisture: Keep the area of pigmentation lightly lubricated with a light film of Aquaphore Do not put on too much. Apply two times per day--once in the morning, and once at night--for ten days. If a crust appears on the pigmented surface, DO NOT FORCE THE REMOVAL BY PICKING, SCRATCHING, OR WASHING!!! PIGMENT MAY BE REMOVED ALONG WITH THE CRUST!!! The brows will start off dark and will flake over the ten days. Once the brows have flaked, it takes another few weeks for the colored area to heal. The area can sometimes be pink or hazy during the healing process . It takes at least one follow-up for desired results. Yearly touch-ups are normally required depending on how well your skin holds ink. Avoid makeup on pigmented area for five days, including non-allergenic makeup. Also, shower with your back to the water to keep water, shampoo, and conditioner from getting into the pigmented areas. Have a light application of lubrication on the pigmented area during showers. Do not be alarmed by fading after the first application. The final color cannot be judged until at least three weeks after the touchup applications are completed. This is the reason follow-ups are required. Swelling: Moderate. Following the procedure, you may find the area slightly puffy for the first few mornings. Use only Artificial Tears product to moisten and cleanse eye area. · Soaps, facial cleansers on pigmented area. · Eye makeup (included non-allergenic makeup) until flaking is finished. · Retin-A on pigmented area. · Hot, long, steamy showers. · Terry towels on pigmented area. · Mascara (then begin with a new bottle of mascara). Shower with your back to the water to keep water, shampoo, and conditioner from getting into the pigmented area. IF EYES BECOME INFECTED, call your physician and obtain prescription for eye drops. Do not rub eyes: doing so may cause damage. Do not be alarmed by fading after first application. The final color cannot be judged until three weeks after touch-up applications are completed. Swelling: Moderate. An ice bag should be applied for the first few hours, alternating ten minutes on, ten minutes off. Moisture: Lips will tend to be very dry. Keep them moist with shea butter or shea oil ONLY. Some peeling may occur. DO NOT PEEL OFF! Do not wipe your lips with a napkin while eating; blot instead. Drink through a straw. Lips have a tendency to fade up to sixty percent after the first procedure. No smoking right after lip procedure. If you have a history of cold sores, make sure you contact your doctor for a prescription of Valtrex medication. · Retin-A on the lips. · Drinking without a straw. · Sun on pigmented area. · Any topical product such as Chapstick, Blistex, or Ambesol. USE ONLY AQUAPHORE.